The Eugenics and Birth Control movements were forced to completely re-make themselves after the Holocaust. Returning to the root Malthusian assumptions, their focus turned to ‘over-population.’ Many, if not most, of the measures entertained prior to the Holocaust remained on the table for consideration. Only the reasons for implementing those measures were changed. Thus, in the 1950s and 1960s, calls for ‘population control’ increased in frequency and volume. See Paul Ehrlich’s “The Population Bomb” as one example that made a dent in popular opinion. But population control advocates understood that the scope of the problem they were presenting required government action at all levels. Thus, Richard Nixon was prompted to enact population control legislation (still in force today). In 1972, Nixon would call for a commission to ‘study’ the problem and present recommendations. This is known as the Rockefeller Commission Report. While Nixon did not implement the Rockefeller Report, he did commission Kissinger to conduct a top secret report on the same topic (known as NSSM-200), albeit with a greater focus on third world nations rather than the United States. He resigned before he could do anything about the Kissinger Report, but Gerald Ford authorized its implementation. There is no official evidence to this day that its implementation has been suspended. So, it cannot be said that the Jaffe Memo is some kind of outlier. The Population Control movement was big and bold and coming into full flower, just as Jaffe was penning his memo. For more about this historical context, here is a timeline related to NSSM-200, an official government strategy for implementing population control on a global scale. That this is pure deception is revealed merely by looking at the materials which they provided. Assuming someone is just barely literate, they can quickly determine that the full memorandum, as well as the “Review of the Literature” by Elliott, et. al, are internal documents or reflect internal conversations related to helping Planned Parenthood determine the shape of their actions. True, the documents do not in themselves recommend any particular course of action, but neither do they condemn any particular course of action, and, worst of all, are perfectly willing to consider any of them, should they be convinced that they are viable and/or necessary! From Jaffe’s own memorandum, we also see how his purpose was to generate ideas that they could seriously consider implementing. Because it helps explain what the memo meant by “Selective Impact Depending on Socio-Economic Status”– that is, proposals expected to work differently on black communities versus white ones, the quote was expanded and the relevant portion underlined. The obvious question from all of this is this: so just what did Planned Parenthood decide? 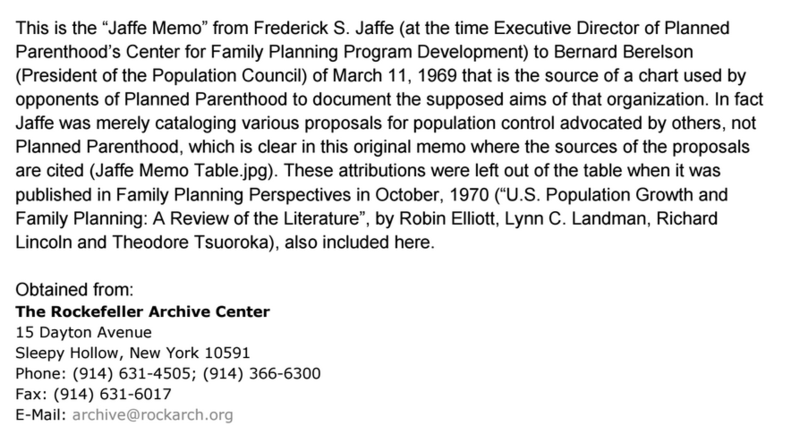 * Recall that Elliot is writing in the capacity as a program analyst in Planned Parenthood’s World-Population Division, which was led by Jaffe himself, and that this very same document includes Jaffe’s table.